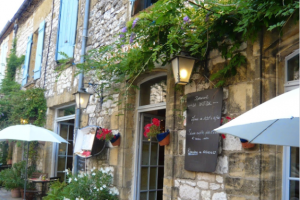 Typical regional dishes include melted goats cheese on toast, escargots (snails), duck breast in a rich wine sauce and, of course, foie gras. Lunch time is the best value, when you can enjoy a three course lunch menu (menu du jour) from around 12 euros including wine. For gourmets, there are several haute cuisine restaurants to be found locally, including La Toque Blanche, a 1 Michelin star restaurant in Pujols (40 mins). 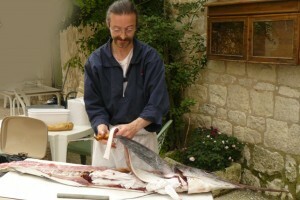 Laid-back or nouvelle cuisine, whatever you fancy, you’ll find a great choice of restaurants in the locality. 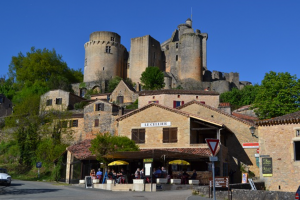 Regular haunts of ours include Le Cellier at Chateau Bonaguil (superb in the setting sun), La Bastide in Monpazier and Le Jardin in Monflanquin. There are plenty more however, so when you book your visit to Le Seguinet, we’ll share our other favourite restaurants with you and help you make reservations.